This week the Bang Group will present two shows of rhythm-driven works at the Yard’s Patricia N. Nanon Theater in Chilmark. In “Song and Dance,” choreographer David Parker will take the stage solo to sing and tap Mozart’s “Turkish March.” “Settling Scores” features veteran tappers Jeffrey Kazin, Nic Petry, Tommy Seibold, and Amber Sloan in a freewheeling, experimental tap dance translation of Morton Feldman’s “For John Cage.” Continuing the Bang Group’s ongoing exploration of iconic musical scores, “Surrender Dorothy” is set to music from “The Wizard of Oz.” Part essay, part fantasy, part rumination, this piece mixes a cappella rhythm and body music sections with complex, whimsical, and ironic dances, set to selections from the movie soundtrack including rehearsal segments and deleted songs. In all six works, body rhythms become a bold but ever so precise means of conversing, with humor and emotion always coloring the danced dialogues. “Parker and his Bang partners, Jeff Kazin, Amber Sloan, Nic Petry, and Tommy Seibold, are not only accomplished dancers but smart stylists. 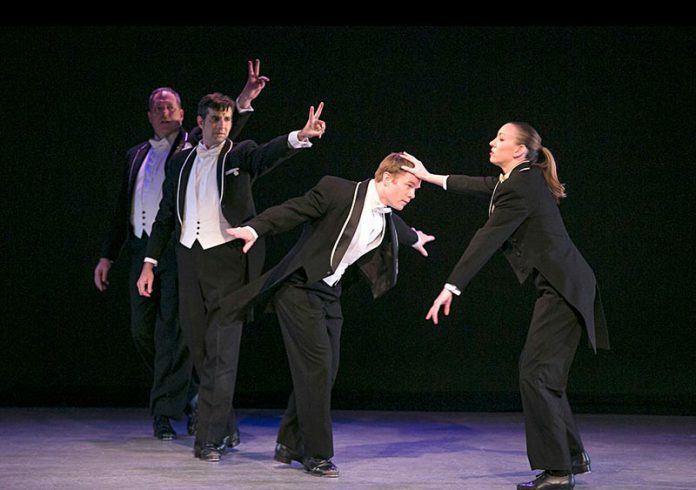 They’ve glossed iconic ballets, musical comedies, and popular song. Their irreverent but loving dances incorporate characters and lyrics we all know, inviting us to recognize the references and share the fun,” says Marcia B. Siegel of Arts Fuse, Boston’s online arts magazine. The Bang Group, directed by David Parker and Jeffrey Kazin, comes to Martha’s Vineyard for the fifth summer in a row to perform in the Yard Arts season, as a special TapTheYard presentation. The Bang Group, Friday, August 28, at 8 pm and Saturday, August 29, at 6:30 pm, at the Yard in Chilmark. Tickets: $25 for general admission; $15 for seniors, students, and active military. For additional information visit dancetheyard.org.